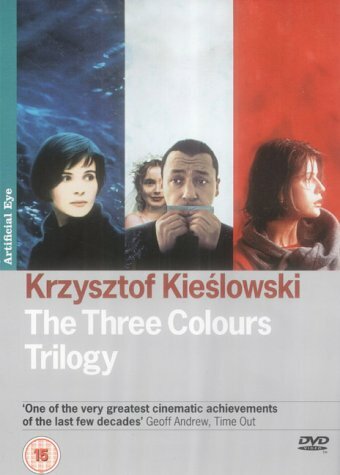 Krzysztof Kieslowski’s multi award-winning trilogy is a landmark of world cinema. Three Colours: Blue, White and Red have been acclaimed as masterpieces by critics and audiences the world over. The films, co-written by Kieslowski and Krzysztof Piesiewicz, with whom he wrote the epic Dekalog cycle, explore the French Revolutionary ideals of freedom, equality and brotherhood and their relevance to the contemporary world. Featuring outstanding music scores by Zbiginiew Preisner and immaculate performances from Juliette Binoche, Irene Jacob and Jean-Louis Trintingnant among others, the trilogy is arguably the foremost achievement by one of the world’s greatest directors. This four-disc set brings together all three films along with a wealth of supplementary features, including Krzysztof Wierzbicki’s fascinating documentary about Kieslowski, I’m So-So …. Krzysztof Kieslowski’s multi award-winning trilogy is a landmark of world cinema. Three Colours: Blue, White and Red have been acclaimed as masterpieces by critics and audiences the world over. The films, co-written by Kieslowski and Krzysztof Piesiewicz, with whom he wrote the epic Dekalog cycle, explore the French Revolutionary ideals of freedom, equality and brotherhood and their relevance to the contemporary world. Featuring outstanding music scores by Zbiginiew Preisner and immaculate performances from Juliette Binoche, Irene Jacob and Jean-Louis Trintingnant among others, the trilogy is arguably the foremost achievement by one of the world’s greatest directors. This four-disc set brings together all three films along with a wealth of supplementary features, including Krzysztof Wierzbicki’s fascinating documentary about Kieslowski, I’m So-So ….